Plaid is another popular trend this season! One of the hottest trending styles out right now is plaid! Plaid and I go way back, as it’s always been one of my favorite types of prints, and when I saw ‘Plaid And Simple’ listed on Elle’s Fall Trends List, I knew I’d be all over it! At the time I posted all of the latest trends, I only had a plaid skirt in my closet (pictured in the HIWI Gallery below). So I set out to find a cute top I could sport. The choice was a hard one because there were so many fun options out there! I was sort of overwhelmed by all of the choices! Check out what I saw in Kohls! I shopped around and finally settled on the cute top I’m wearing above, by Zac & Rachel, purchased from TJ Maxx. I loved the colors and immediately had options of wearing it with my red, grey and even black pants. 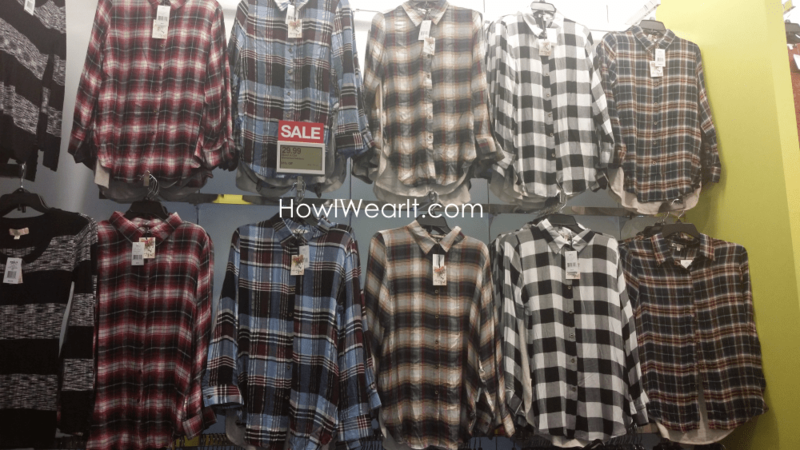 This is one of the big reasons why I love plaid…there are a lot of color options for matching and pairing with wardrobe pieces you may already have in your closet! Here are some similar suggestions! For more inspiration, check out our contributors showcasing how they wear plaid! Never Too Early To Rock It! Layered tops with matching vest & boots, topped off with a cute Coach handbag! Leather jacket & jeans with infinity scarf flannel shirt layers! Tee shirt and leggings glammed up! Do you have any plaid in your closet? What are some of your favorite pieces to wear? ← All Grey Everything Grey Look Book!